Coach Pate is a lifetime resident of Gordo, AL. He is a husband and father. 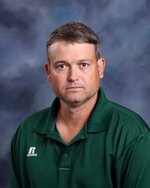 Along with teaching he also coaches jr.high football and varisty baseball. The thing I like most about my job is the challenge and excitement everyday. It is rewarding to make a positive impact on someone else through teaching and coaching. The opportunity to be a part of the lives of others and see them succeed is what keeps me motivated .